Gastric surgery is proving to be the silver bullet in effective treatment -- and remission -- of type 2 diabetes mellitus in obese individuals. Gastric surgery is proving to be the silver bullet in effective treatment -- and remission -- of type 2 diabetes mellitus in obese individuals, but whether surgical intervention is the best option for mildly overweight or normal-weight patients with diabetes remains an open question. That’s the word from Mustafa Ahmed, M.D., of Southern Nevada Bariatrics, who says increasing scientific evidence offers hope for stemming the epidemic of diabetes in the United States through weight-loss and metabolic surgery. “Bariatric surgical procedures long have proven effective – and safe -- in treating severe obesity, a chronic and deadly disorder. What is generating excitement now in the medical field is how metabolic surgery is seemingly impacting treatment of type 2 diabetes. Until now, type 2 diabetes has been manageable, but very difficult to reverse, despite medication and lifestyle changes,” says Dr. Ahmed, who is board-certified in internal medicine, surgery and surgical critical care. 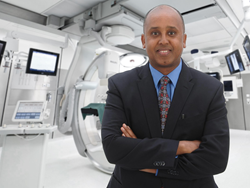 Dr. Ahmed points to the latest study, appearing Sept. 21, 2017, in the New England Journal of Medicine (NEJM), in which authors report that patients who underwent Roux-en-Y gastric bypass to reduce the size of the stomach sustained weight loss and “effective remission and prevention of type 2 diabetes, hypertension and dyslipidemia” (a metabolic disorder) for a period of at least 12 years. More than 1,100 patients participated in the study, with 418 of them undergoing surgery. That research builds on another study, called the STAMPEDE trial and published in NEJM in February of this year (2017), which indicates bariatric surgery, coupled with intensive medical therapy, is superior to intensive medical therapy alone in achieving safe blood sugar levels in obese patients diagnosed with type 2 diabetes, Dr. Ahmed says. Benefits of surgery – either gastric bypass or sleeve gastrectomy, in which a large part of the stomach is removed – were sustained for five years in a majority of the 141 participating diabetic patients, STAMPEDE study investigators report. Those benefits included weight loss, lower blood levels of fat (tryglicerides), improved levels of blood glucose (sugar), better kidney function, reduction in use of cardiovascular and glucose-lowering medications and overall enhanced quality of life. More than 30 million people of all ages – nearly 10 percent of the U.S. population – had some form of diabetes – either diagnosed or undiagnosed -- as of 2015, according to a 2017 report issued by the Centers for Disease Control and Prevention. Obesity is a leading cause of the disease, which occurs when cells in the body fail to process insulin properly, resulting in a buildup of glucose (sugar) in the bloodstream. Over time, these high sugar levels can damage the heart and blood vessels; kidneys; nerves, including ones affecting digestion and feelings in feet; and the eyes, leading to visual loss and even blindness. Why bariatric surgery is proving so successful in remission of diabetes is still uncertain, but Dr. Ahmed says some researchers suggest surgical intervention causes hormonal changes that enhance metabolism. A study published last year in the American Journal of Pathology linked benefits of gastric surgery to possible improvements in the microorganism community populating a person’s gut. “In fact, scientific evidence in support of metabolic surgery for treatment of diabetes is proving so overwhelming that, in 2016, the American Diabetes Association (ADA) issued revised treatment standards, suggesting that metabolic surgery be considered for appropriate patients with uncontrolled diabetes and body mass indexes (BMIs) as low as 30,” Dr. Ahmed says. Past standards have not suggested surgical consideration for diabetic patients with BMIs under 35. The Cleveland Clinic announced in July 2017 that its own team of scientists is leading a multicenter, clinical trial to assess the long-term benefits of bariatric-metabolic surgery compared to lifestyle and medical therapy in treating type 2 diabetes in patients with mild to moderate obesity and BMIs as low as 27, Dr. Ahmed says. Whether bariatric surgery will be considered a “mainstream treatment” in the future for type 2 diabetes patients who are only mildly overweight (BMIs of 25-27) or at normal weight (BMIs 18-24) is still an open question, Dr. Ahmed says. “Perhaps, for these patients, we will find interventions that produce the same results and benefits as metabolic surgery, but avoid unnecessary weight loss,” he says. Mustafa Ahmed, M.D., is board-certified in internal medicine, surgery and surgical critical care. He has conducted research in incisional wound healing and atrial fibrillation. Southern Nevada Bariatrics (http://www.southernnevadabariatrics.com) offers the latest state-of-the-art and gold-standard surgical procedures for weight control. Its highly rated team provides such surgical interventions as Roux-en-Y gastric bypass, vertical sleeve gastrectomy and the LAP-BAND® Bariatric Surgery System.